The hypostile hall of the Maniace Castle in Syracuse has restored and opened to the public thanks to El.En group's lasers for cultural heritage. The project was launched by the Superintendency of Cultural Heritage of Syracuse and funded by the Civil Protection Department with a total amount of about 3.6 million euros. El.En. 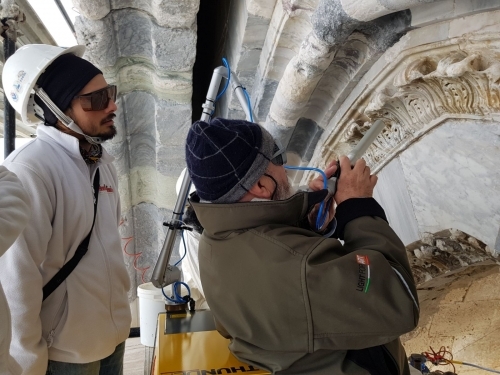 Group contributed significantly to the restoration work by making available his laser tools for the restoration of capitals, inlays and stone decorations of the hall. The latter is a unique and large central area of ​​the Castle built by Frederick II of Swabia to defend Syracuse. The hall is an architectural masterpiece with cross vaults, columns and semi-columns that make it a magical place, so much so that in 2009 it hosted the G8 Ambiente. The intervention is part of a wider project of anti-seismic adaptation of the building with further interventions to strengthen the façade of the castle as well as numerous interventions for the consolidation and adaptation of the plants. After these actions, the hypostyle hall is now completely accessible to visitors thanks to a series of local associations (Confcommercio-companies for Italy, Cultural Koinè, Kivanis club, FIDAPA, Club Service International Inner Wheel, Lions Club "Siracusa Host") and can benefit from a surveillance service.